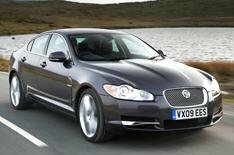 Jaguar XF: driven | What Car? We test drive the new 3.0-litre Jaguar XF. Most people would have been perfectly happy with the 2.7-litre V6 diesel engine in the XF indeed, weve been running one for nearly a year, and it hasnt attracted a negative comment. The result is a car that now delivers 237bhp instead of 204 and 369lb ft in place of 320. Naturally, its a quicker car as a result, increasing momentum more rapidly for less effort, but possibly the major advantage is that its more eager to set off from rest a major boon when looking to pull out into the traffic. There are times with the 2.7 that youre unable to ignore the XFs weight, shall we say? A drop of four company car tax bands and, potentially, an extra 4.4mpg arent insignificant benefits, either. You lose none of the cars astonishing mechanical refinement, and the engine change has been accompanied by a bit of useful tidying-up in the cabin. Some of the switchgear has been repositioned for the better, and the sat-nav turn-by-turn instructions are now repeated in the instrument cluster. What will Jaguar come up with next?